Calculating the Cost of Global Warming | Watts Up With That? Hopefully, the first two posts in this series, “Do humans harm the environment” and “Population Growth and the Food Supply” have convinced the reader that man-made climate change and global warming are not an existential threat to humanity or the planet. This leaves us in a discussion of the cost of global warming, which is something we can calculate. To do the calculation, we need to estimate the monetary damages caused by global warming, when they will be incurred, and the discount rate of money over that period of time. We will not attempt the calculation here, it is too complex, but we can discuss the parameters and some of the calculations done by others. We should remind the reader, that the assertion that humans have caused most of the recent global warming has not been proven. The calculation of human influence on climate is based only on unvalidated climate models as described here and here. In fact, most climate models cannot model the global warming from 1910 to 1945. If they can’t hindcast known global warming, how can they accurately forecast it? Forecasting natural warming is obviously critical to computing the magnitude of man’s impact, so we must remain skeptical of any calculation of man’s influence. To compute a cost for global warming, we have to assume global warming has a cost. Then we must assume a value, in lives and treasure, for that cost. We also need to assume a timetable of the costs and benefits, so we can apply an assumed discount rate for the money spent and the money saved. One might say dubious climate model results are fed into dubious economic models and projections are then made for 100 years. Humans certainly affect the climate to some degree, many major species do, especially trees and phytoplankton. Climate change, whether natural or man-made, is a risk. There are always two options in dealing with climate changes, we can adapt to the changes or, if we are the cause, we can mitigate them by changing our behavior. The two options can conflict, if mitigation reduces our use of fossil fuels, a cheap form of energy, and we adopt an alternative fuel that is more expensive, we reduce our ability to adapt. Adaptation can involve constructing sea walls, levees and dikes, installing air conditioners, irrigating dry farm land, and many other things that require a lot of energy and transporting large amounts of materials and fuels. Global warming risks and adaptation methods are described in the IPCC WGII AR5 technical summary. Mitigation methods are discussed in the IPCC WGIII AR5 technical summary. What is the cost of global warming? “Global economic impacts from climate change are difficult to estimate. World GDP is currently about $75.5 trillion dollars per year according to the World Bank, so 1% is about $0.755 trillion, that is a lot of money, but that is the IPCC “medium evidence and medium agreement” estimate of the damage global warming can do, +- about 100%, that is 0.15 trillion to 1.51 trillion dollars by 2100! The IPCC estimate of the cost of global warming, is not accurate by any means, the others I will show in this post are not either. But, the estimates are used by pundits, ex-Vice-Presidents, and high school dropout actors, etc. all the time to try and scare us. Let’s examine them. The quote is specific about the “dangerous temperature” of ~2°C, but does not give us a maximum “safe” temperature. In figure 1 we plot four of the IPCC AR5 model ensemble mean surface temperature predictions. There is no data on the plot, just predictions and hindcasts. The RCP (“Representative Concentration Pathway”) is a name given to a set of climate model parameters. The parameters include predicted greenhouse gas emissions and assumptions about how sensitive the climate is to those emissions. In this case the RCP2.6 scenario is a “safe” set of assumptions, so we assume that the warming under this scenario will cause no damage and this sets a limit of 1.1°C over the 1980-1999 mean temperature. 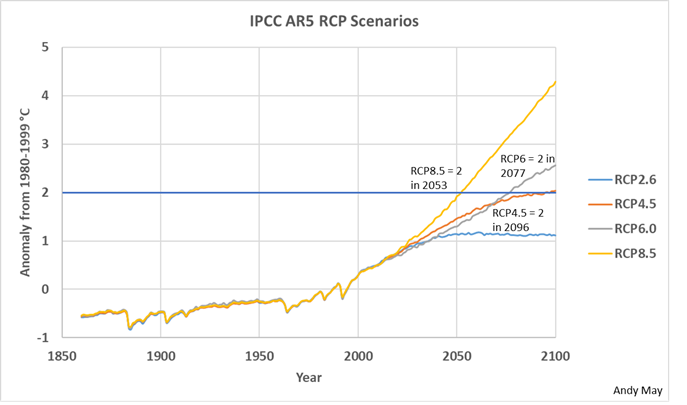 RCP8.5 is a fairly radical “worse case” scenario and under this set of parameters 2°C is reached in 2053. For the sake of argument, we will focus on the RCP4.5 scenario as most analysts do. In this scenario the “dangerous” 2°C temperature is reached in 2096. We adopt these definitions for this post. here, so we will not cover that ground again. Further, reducing fossil fuel use has an immediate impact on our well-being, for a possible and unproven improvement on well-being over 100 years from now. It is fairly likely that currently we are benefiting from the additional CO2 in the atmosphere and it will continue to be beneficial for at least several more decades, if not longer, see the NASA assessment here. Also see the section “Energy and Agriculture” here. In other words, the “present value” of benefits paid in the far future is very small, due to the “time value of money.” Or, one could simply say “a bird in the hand is worth more than two birds in a bush.” If we assume climate change is dangerous and that man’s emissions are the cause, two big “ifs,” then how much do we spend today to avert dangerous climate change in 100 years or more? If the dangers were certain and known, some expenditure would be worth it. But, if the prospective dangers are like those predicted by Thomas Malthus in 1798 or Paul Ehrlich in 1968 (see post 2, Population Growth and the Food Supply), not so much. If we wait until we are sure of the dangers, is the wait dangerous? These are the questions that we need to address. The net present value calculation that I allude to above is very sensitive to the choice of a discount rate, this is particularly true of investments in climate change mitigation or adaptation, because the payout is 100 years in the future or longer. Because the U.S. S&P 500 collection of stocks, between 1975 and 2017, has an average annual rate of return of 7.5%, adjusted for inflation, with dividends reinvested, this value is reasonable to use as a discount rate. The idea being that if you get a positive net present value at 7.5% you have beat the stock market rate of return with your investment. But, if you can’t beat the S&P 500, just put your money into the stock market instead. Discount rates between 6% and 12% can be used and justified. Before 2100, when all our climate change money goes out and none is coming in, 6% loses twice as much money as 12%, but both lose a lot of money. This money comes out of taxpayers pockets and goes to alternative fuel manufacturers or other organizations meant to reduce greenhouse gas emissions. Dr. Bjorn Lomborg, Dr. Richard Tol, Alex Epstein, Dr. Matt Ridley, and Dr. Roger Pielke Jr. have written extensively on the economics of climate change. This series of posts are mostly based upon their work and the IPCC AR5 report. We have especially relied upon Lomborg’s Cool It, Epstein’s The Moral Case for Fossil Fuels, Ridley’s The Rational Optimist, and Pielke Jr.’s The Climate Fix. Like us, they do not question the idea that man is causing some of the recent global warming, they simply use the IPCC climate forecasts to determine the costs of global warming to society. While it has not been proven that man is the cause of most of the warming since the Little Ice Age (see here), it is still useful to discuss the cost of warming and various proposed solutions. The Little Ice Age, which ended in the mid-1800s, was the coldest period in the Holocene. It is not a climate we should be trying to return to, see here. We list some commonly claimed costs (or hazards) of global warming and, when appropriate, the potential costs of either adapting to the warming or mitigating the temperature change through reductions in fossil fuel use. We will only discuss a few of the more well-known claimed costs, to address all of them would be impossible, climate change has been blamed for a large number of problems, including stunting Chinese manufacturing, starting the Syrian civil war, decimating bumble bees, and so on. A comprehensive list of claimed costs and hazards can be seen in the AR5 WGII technical summary. We will stick to the more conventional claims. There have been two international agreements to mitigate climate change by reducing fossil fuel use. They are the Kyoto and Paris agreements. These agreements assume that current climate models are correct, and temperatures are mostly increasing due to human fossil fuel emissions. The countries in the agreements pledged to reduce their fossil fuel emissions to mitigate global warming. Here we discuss the cost of this mitigation to achieve a baseline cost. The Kyoto treaty, if it had been implemented, was expected to cost $180B/year or 0.5% of global GDP (from Cool It, Kindle location 472, original source here). “For the full Kyoto Protocol with the United States participating, the total cost over the coming century turns out to be more than $5 trillion. There is an environmental benefit, from the slightly lower temperature toward the end of the century: about 0.3°F. The total benefit for the world comes to almost $2 trillion.” Lomborg, Bjorn. Cool It (Kindle Locations 610-613). Curtailing the fossil fuel industry would have additional repercussions. Since, the oil, natural gas and coal industries amount to about $4 trillion/year or 5.5% of global GDP, limiting or eliminating these industries would cost a lot of jobs and economic disruption. So, the excess cost of mitigation, over the value of the benefits, could be even higher than the estimate of $3 trillion noted above, depending upon what happens to the fossil fuel industry. If reducing or eliminating fossil fuels reduces world GDP, as most expect, it will increase the number of poor and lower our standard of living. Both of these factors will affect world health as noted in a Journal of Human Resources article “Wealthier is Healthier,” by Lant Pritchett and Lawrence Summers (1996). If the U. S. had stayed in the Paris agreement, it would have committed the U.S. to reducing its carbon dioxide emissions by 26-28%, relative to 2005, by 2025. This was not achievable with the regulations currently in place and additional regulations and/or taxes would have been required. Estimates of the cost of the additional regulations required, including the, now defunct, CPP (Clean Power Plan), vary from $37 billion (RFF) to $250 billion (NERA) in lost GDP by 2025. Economy-wide job loss estimates vary from no job losses (RFF) to more than 2.7 million by 2025 (NERA). The higher GDP and job losses are from a study by NERA. Lower estimates are from a liberal think tank “Resources for the Future” (RFF) article by Chen and Hafstead, 2016. Both studies acknowledge that regulations and efforts in place in 2016 were not sufficient to meet the U.S. Paris commitments. 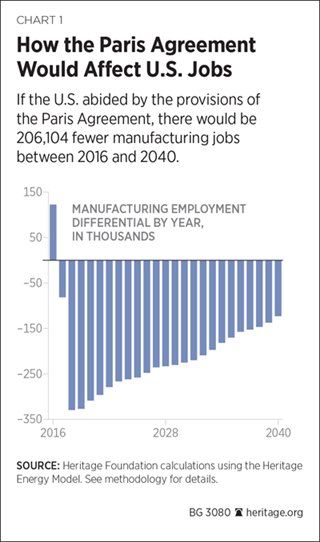 The Heritage Foundation estimates the U.S. would lose 206,104 manufacturing jobs alone, see figure 2. The differences in the estimates stem from differing views on the relative future cost of energy from alternative sources and fossil fuels; plus, the costs of meeting the U.S. emission reduction commitments. The NERA estimate uses current cost estimates for alternative fuels that are generally accepted by the EIA and IEA. The RFF essentially assumes, using projections of the current rate of decline of alternative fuel costs, that alternatives will be as cheap, if not cheaper than fossil fuels. This is very unlikely, given the reasons detailed here. Calculating the relative cost of energy produced using different sources is quite complex, but currently and for the foreseeable future solar, wind and biomass energy sources are net negative. That means we use more energy making the fuels and/or operating the power plants than we get out of them. For the details of the calculations involved, see here and here. Computing job losses depends upon how expensive western energy becomes as they curtail fossil fuel use. India and China will be allowed to use all the fossil fuels they like, so their energy costs will be very low compared to the West. Manufacturing jobs will move to where the cheap energy is. For example, cheap natural gas and electricity is why Voestalpine and Tanjin Pipe group moved to Corpus Christi, Texas. Due to higher paying manufacturing job losses, people will migrate to lower paying service sector jobs, this will lower family incomes. Absent a dramatic breakthrough in fusion or conventional nuclear power, renewables, except for hydroelectric, will remain prohibitively expensive, unless heavily subsidized. Conventional nuclear is economic, but regulations make it very difficult to install. Fusion and thorium reactors are not commercialized yet, but if they are they could be a game changer. The NERA assumptions are more realistic. I know of no credible scenario where alternative fuels could be as cheap or cheaper than fossil fuels, without an enormous carbon tax, that would drastically lower our standard of living. And, since the Paris agreement allows China, India and other developing countries to burn as much fossil fuel as they like; the effect of such a tax would be to transfer jobs and wealth to the developing world. This is a policy very unlikely to succeed or to be very popular in the developed world. Especially in the United States. The New York Times likes to say that more people work in the solar power generation industry than in the coal power generation industry. This sounds great until you realize that in 2016, according to EIA, solar produced 0.9% of our electricity with 373,807 people, versus coal which produced 30% of our electricity with 160,119 people. Productivity growth is where our standard of living comes from, switching to solar is going in the wrong direction. Its apparent that the NY Times is ignorant of basic economic principles. See the New York Times graphic in figure 3. What this means, is that it takes 83 solar workers to produce the same amount of electricity as 1 coal worker. This only makes economic sense if the solar workers are paid 1.2% of a coal worker’s pay. Figure 3, source New York Times. “In a global macroeconomic model, the total present-day cost for a permanent one-dollar CO2 tax is estimated at more than $11 billion. So, we might want to think twice about cranking up the knob to a thirty-dollar CO2 tax, which will cost almost $7 trillion.” Lomborg, Bjorn. Cool It (Kindle Locations 558-561). “Second, [Richard Tol] finds that with reasonable assumptions the cost is very unlikely to be higher than fourteen dollars per ton of CO2 and likely to be much smaller. When I specifically asked him for his best guess, he wasn’t too enthusiastic about shedding his cautiousness—true researchers invariably are this way—but gave a best estimate of two dollars per ton. Lomborg, Bjorn. Cool It (Kindle Locations 574-578). The Paris agreement would only have eliminated coal related jobs in the U.S. and other western countries, essentially transferring these jobs to India and China where coal use would continue to increase. This is also true of the steel industry and some portion of the oil and gas industry. Basically, it was a very bad deal for the U.S. and the U.S. withdrew from the agreement for that reason (see here). World energy consumption continues to increase. 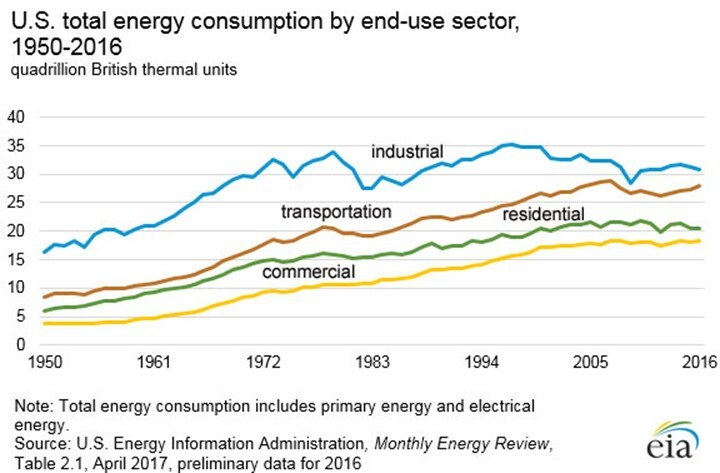 Even in the U.S. total energy consumption is increasing, see figure 4. Appliances, houses and cars are more efficient today, but we use energy to power many more things these days. 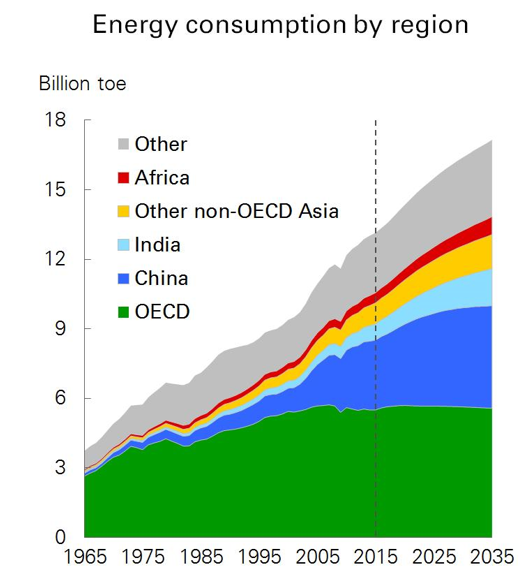 According to the BP Energy Outlook for 2017 total energy consumed in the world has quadrupled since 1965 and it is projected to continue to increase, see figure 5. “Stabilizing the temperature increase to 4.5°F … cost[s] $15.8 trillion. It is instructive to compare this to the total cost of global warming. Models show that if global warming wasn’t happening, the world would end up about $14.5 trillion richer. Thus, the cost of global warming can be estimated at $14.5 trillion. Stabilizing the temperature increase at 4.5°F … means we end up paying more for a partial solution than the cost of the entire problem. That is a bad deal.” Lomborg, Bjorn. Cool It (Kindle Locations 646-650). “Thus, as one academic paper [Kavuncu & Knabb, 2005] points out, ‘the costs associated with an emissions stabilization program are relatively large for current generations and continue to increase over the next 100 years. The first generation to actually benefit from the stabilization program is born early during the 24th century.’ If our desire is to help the many generations that come before then, along with the world’s poor, cutting emissions is not the best way. Perhaps more surprisingly, cutting emissions is also not the best way to help people in the twenty-fourth century, since we could have focused on solving many other immediate problems that would leave the far future much better off.” Lomborg, Bjorn. Cool It (Kindle Locations 672-677). “Kyoto is an extraordinarily expensive way of doing very little good far into the future,” Lomborg, Bjorn. Cool It (Kindle Locations 637-638). Can climate models be devised to predict that human emissions can cause great financial damage? Yes, they can be constructed, but are they accurate? Are they accurate enough that we must reduce our fossil fuels use? Reducing fossil fuel use raises the cost of energy and makes us poorer, less adaptable, and thus more vulnerable to climate disasters. “Alarmism has a long history in the climate debate. Perhaps most chillingly, this was evident in the witch trials in medieval Europe. After the Inquisition’s eradication of the actual heretics (like Cathars and Waldensians), most witches from the early 1400s onward were accused of creating bad weather. The pope in 1484 recognized that witches ‘have blasted the produce of the earth, the grapes of the vine, the fruits of the trees, … vineyards, orchards, meadows, pasture-lands, corn, wheat and all other cereals.’ As Europe descended into the Little Ice Age, more and more areas experienced crop failure, high food prices, and hunger; witches became obvious scapegoats in weakly governed areas. As many as half a million individuals were executed between 1500 and 1700, and there was a strong correlation between low temperatures and high numbers of witchcraft trials across the European continent.” Lomborg, Bjorn. Cool It (Kindle Locations 1825-1833). Even when the cause is obviously natural, society still needs to find someone to blame (more on this topic here). Jumping way ahead of our data, even when done with computer models, and proclaiming that climate change is man-made and dangerous before we see any direct evidence is also dangerous. This will cost us in standard of living, it will reduce the rate of improvement in poverty and malnutrition and income inequality that we have enjoyed for decades. But, most important, it will reduce our ability to adapt to climate changes. Further, asserting climate is dangerous, using dodgy climate models to project climate into the far future, then taking the output from the models and running it through dodgy economic models to compute costs, is a strange and dangerous fiction. The one takeaway, from this post, that I hope every reader sees is that we really do not know what the climate future is, and we certainly cannot compute the cost. Further, no one credible is predicting any serious costs to global warming, whether natural or man-made, for over 100 years. We have time to wait and see what is going to happen before we impoverish ourselves. The IPCC only seems to focus on the negative aspects of climate change and not the positive aspects. The positive aspects are most apparent today, increasing crop yields, increasing arable land and fewer dying due to cold. The benefits of global warming outweigh the hazards today, and will for the foreseeable future. December 14, 2017 in Climate Economics. Calculating the cost? Seems a rather futile exercise. But to make it simple; pick any number, then add any number of zeros. Reverse the calculation for finding the benefit of warming. I think the number is 42. But, of what units was never stated. It is no coincidence that we find climate models so often in same nest with economic models. They share the same pedigree and masters. There are roughy 100 climate models. Only one climate. That means any averaging or grouping is 99% wrong. Worse, in the case of the IPCC three scenarios, two are totally wrong and one is 97% wrong. There’s that number again. This article does a good job of quantifying the costs and benefits. The bottom line is, the most effective, efficient, affordable and achievable way to improve the lives of countless people living in poverty is to get them a reliable, accessible and inexpensive energy source. If the people voting to waste other people’s money on fighting climate change had to live a single day without the cheap energy they are accustomed to, they would immediately change their attitudes. Fighting climate change is an agenda of the elites detached from reality. And a very modest income, I am sure, to not a few wind-meisters and solar-bunnies. Local renewable power [remote locations, etc.] really does have a value. With batteries a plus value. But base load – as implied by some water-melonistas – will simply not work 24/7/365. A blocking high over western Europe, in winter [a quarter of the year] and everything grinds to a halt. 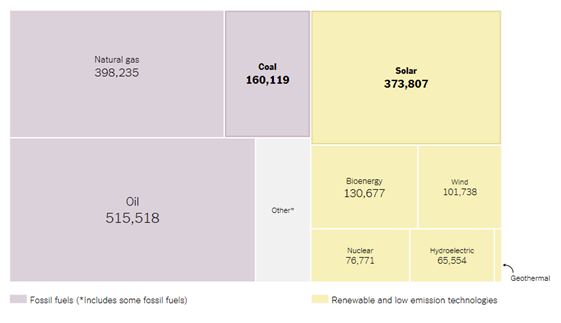 Including hospitals, electric cars – and heavy industry – if all depend on renewables . . . . Better batteries will help – yes. But – ahhhh – when? People have been led to believe that clean green energy will not cost them much money. 0.5% GDP is very different, whether you enjoy 10% or 0.5 % (or even lower) growth per capita beforehand. In the first case you still enjoy robust 9.5% growth. In the second, you are eating up your assets. One factor I never see included in these estimates is fossil fuel depletion. I’ve estimated the peak CO2 concentration to be about 630 ppm, this is reached in the 22nd century. The ultimate temperature anomaly increase is about 1.5 degrees above the 1980-2010 average. I acknowledge this is a deterministic estimate based on very coarse asumptions, including assumed technology developments which allow humanity to gradually replace fossil fuels to some extent. I realize there’s a sense in these discussions about climate change that fossil fuels are somehow endless, but reality will bite sometime in the next couple of decades, and both sides of the debate do need to consider this issue in their mental gyrations (and their models if any). Once one sees like I do that fossil fuels do have a limit, it’s fairly easy to see that research and development in energy alternatives, and investment in those that make sense, are pretty good ideas. Although crude oil is the most common fossil fuel used currently, others exist and exist in abundance. Only their cost of conversion to useful transportation fuels keeps them from being used currently. There is 400 years of coal reserves if converted to fuel using F-T technology. There is abundant NG that can also be converted to transportation fuel using the same technology. And in the more distant future there is hugely abundant off-shore methane hydrates that require technology advances to capture but can be converted to transportation fuels easily once production is demonstrated. Then there are abundant oil sands also of higher cost but available nonetheless as cost of fuel increases. So the future is not so dim for liquid hydrocarbon fuels for maybe 500 to 1000 years. Surely time enough to redirect society to other modes of transportation. “Beam Me Up, Scotty!” comes to mind, but requires several technology developments to achieve this goal. Based on estimates of global anthropogenic CO2 emissions and the rate of increase in the CO2 concentration at Mauna Loa over the past seven years, the increase in the total mass of CO2 in the atmosphere is about 53% of man-made emissions, meaning that 47% is removed by natural sinks (photosynthesis, absorption by the oceans, fabrication of carbonates by shellfish, etc.). If the rate of removal by the sinks was linearly proportional to the CO2 concentration, and excluding natural sources of CO2 (animal respiration, volcanoes, fires caused by lightning, etc. ), the equilibrium maximum concentration would be about 400 / 0.47 = 850 ppm, or slightly more than twice the current concentration. The actual equilibrium concentration is probably less than this value, because the natural sinks are currently removing 47% of man-made emissions plus the natural CO2 emissions, so that if the sink-removal rate increased linearly with concentration, the equilibrium would be reached at a lower concentration. The point is, there will not be a runaway increase in CO2 concentration, because the removal rate by natural sinks should accelerate with concentration. But even if the maximum concentration was 630 ppm as calculated by Fernando Leanne, if the growth rate of plants was proportional to CO2 concentration, people living in such a future CO2 concentration could enjoy about 57% more food production than now. They’re pretty good ideas Ferando but as you can see, 630 ppm is probably optimistic. Afterall what could be “cheaper” than finding it lying around? Oh and btw, how far off 1.5C do you think we are now? I agree Fernando, the issue of the impact of fossil fuel limits on climate change is rarely raised because one side wants to scare with a never ending emissions increase, and the other doesn’t believe in fossil fuel limits. Wang, J., et al. “The implications of fossil fuel supply constraints on climate change projections: A supply-side analysis.” Futures 86 (2017): 58-72. They agree quite a lot with your calculations. Thanks for the link. I think the agreement is coincidence, because I split the oil molecules, assume ethane and a bit of other NGL is used in plastics, allow for some road asphalt, and reduce Venezuela reserves to account for current field performance, which tells me recovery factor will be about 40% of what was assumed by pdvsa. Javier, one other issue I think needs attention is the carbon cycle module. I built a very simple one in excel, and it shows decreasing CO2 concentration once emissions drop to 1/3 of the peak emissions rate. I think it depends a lot on how one models ocean absorption of co2, buffering, etc. Yes, I agree on that too. The alarmist position based on Archer views is that a very long residence time will prevent CO₂ levels from decreasing, but the unexpected increase in carbon sinks suggests that the biosphere is likely to soak up the excess carbon as candy. If we reduce emissions the sinks will not reduce until atmospheric CO₂ decreases. The effect ought to be a faster CO₂ reduction than anticipated by models. Everything is blown out of proportion to sell a scary worst case scenario. It is not probably the place, as its relation to climate is tenuous, and I don’t doubt you know a lot more about the issue than I do. I accept that there is plenty of oil in the world even if the reserves of some countries are being taken as face value when they are clearly fictitious. US shale oil industry has been extremely effective in turning oil from the rocks (petroleum) into barrels of oil and a pile of debt of much higher value than it has been obtained by selling the barrels of oil. Such miracle has not been reproduce anywhere else in the world, a clear sign that in countries with more orthodox economic constrains the numbers don’t add up. And in these times of unprecedented economic policies, debt doesn’t matter until the day it matters. Anyway I have looked at the issue of CO₂ emissions, not as profoundly as Fernando, that is also an oil man, and come to a similar answer. I don’t think we are going to burn enough fossil fuels to go above 550-600 ppm this century, whether we believe in climate change or not. I think Andy has this right: if CO2 emission are reduced, it wont be through the agency of supply limits. No, humans would need to…never mind. With 1600 new coal fired power stations being built, with a CO2 emission increase of some 43%, with a probably lifetime of 50+ years..
Efforts to do so in once first world countries, will just be transferred, with the manufacturing base, to countries with a reliable power supply. It would be helpful if you would lead with that. (like I did). “good idea” … for who? If it is for you, just do it. You’ll experience if it is really as good as you think. If it is just a belief you have about what others should do, well, that’s legit, although pretty worthless. A government is not required for a good idea to keep running. They do all by themselves, just because people try it and are happy with it (that’s the definition of a “good idea”). So when a government tries to enforce an idea, that’s a very good hint that it must be a very bad idea. Especially when the promoters act the very opposite of their preaching. There is a major drawback in mitigation: if some cold spell happen, mitigation will make it worse. There is major bonus in adaptation: we can adapt to the REAL major risk that will manifest itself, whatever it is (heat, cold, supervolcano, asteroid, virus or whatever). We are very fortunate indeed to be living in the Modern Slightly Warm Period. The big problem hits if the world drops back towards the temperatures of the LIA, (not that far below where we are now). World food supplies , travel, health, industry, electricity etc etc would all be HEAVILY affected. Norway for example, with frozen rivers and lakes, would have no electricity at all ! Scotland, frozen, snow covered wind turbines. Not a pleasant thought for the world at all. !! So far heat showed NO risk. When it show, IF it show, it will be time to adapt. This is nothing more than a political exercise to influence the public, which is the process for most of the GW studies. This is turning into a great series, Andy. I eagerly await future posts. man-made climate change and global warming are not an existential threat to humanity or the planet. While the quantification of presumed damages from a global warming that is not understood is an exercise in futility, the mitigation costs proposed are very real and front loaded. People will certainly oppose the proposed policies if they are told how much they are going to cost them and how much benefit is hoped to be achieved and when. It would be illustrative to imagine if we knew with a 99% certainty that the next glacial period is due in 1000 years. How much should we be expending now to mitigate and adapt to it? My opinion is that we should be expending in science and research to improve our technological capacity and our knowledge to best tackle the problem. By the time it becomes a problem we might have better solutions available than taxing the people now. Even if the next glacial period was due in 100 years, or even 20 years. Thanks Javier. Already working on #4 on extinctions. I devoted a special section to the “Great” Quaternary Megafauna Extinction and Barnosky, 2008, just for you! Glad you liked it, even if you don’t agree. I don’t think the problem is so much one of extinctions, but of reduction of genetic variability. The Iberian lynx, a beautiful animal, has been brought up from critically endangered, with less than a 100 individuals, to endangered with over 900 in the wild at great expense. However its genetic variability is still that of a tiny population, with many animals affected by inbreeding problems. The case of the cheetah shows that genetic variability doesn’t recover in many thousands of years, leaving the species highly vulnerable. As is so often the case, the Iberian lynx has been granted species status without warrant, just to magnify its conservation status. In fact, it remains a subspecies of the Eurasian lynx. The US FWS has wasted tens of millions of dollars on a program to breed supposedly endangered “red wolves”, which are actually coyotes. The program has been a total failure for decades, at the cost of releasing larger than average coyotes, whose ancestors were captured in TX, into rural NC. It has failed because the released “wolves” naturally breed with local coyotes. Because they are coyotes with a bit of grey wolf ancestry. But the worse than worthless, antiscientific program has proved impossible to kill. I might be wrong, but the Irish Wolfhound dog breed almost went “extinct” in the 1800’s. I don’t remember his name but a breeder in the UK (maybe Ireland) brought them back by crossing them (or maybe starting starting from scratch?) with other breeds such as Mastiffs to bring them back. Why not do something like this with the Iberian lynx? That’s always possible with subspecies. Even easier with dog breeds, ie simple variants of the same subspecies of wolf. The range of the Iberian lynx historically overlapped with that of its fellow lynx, the Eurasian. Hence “hybrids” occurred naturally. To diversify the gene pool of Iberian lynxes, simply cross them with lynxes from France, their nearest kin. Andy ==> This whole topic has all the speculative qualities of epidemiology and cosmology…..the similarities in the three topics are that they all start with assumptions not founded on evidence, ignore the huge uncertainties in available data and those inherent in the processes used and depend on calculations not based on proven methods for the purpose. Each then makes definitive statements of results, often to extreme degrees of precision. The Hubris of Computation — the bane of modern science. Kip, yup. Calculations are easy. Assumptions are difficult and must always be carefully scrutinized. I wrote up literally hundreds of examples in The Arts of Truth—even the ebooks title is an example. Doing cost-benefit studies is useful, but one must get down in the weeds and check the assumptions used, or it just turns out to be an exercise in preaching. Doing these studies for a 50 year time span is futile. And the discount rate is a huge factor. By the way, I don’t like the author’s points about a discount rate when used for society as a whole. That debate by itself makes everything else look like fleas on an elephant. or at least in dispute. otherwise all you have is a computer game. And that’s all we have now for so-called climate “science”. The “cost” of climate change is wild speculation. and subsidizing the alternative energy industry. and thereby slowing down the greening of our planet. who need cheap fossil fuels. The problem with doing a cost-benefit study is that the word “cost” has lost all meaning. The debt burden is so enormous (I speak of both formal debts, like bonds, and informal debts, like social obligations for pensions and welfare) that the numbers no longer make sense. There is no balance sheet that reflects reality. We have been unable to balance the books via democratic process for over 50 years and I see no reason to believe we will do so in the future. If one believes, as I do, that the “books” represent an attempt to account for a real physical system then it follows that nature will bring them to balance one day. One shudders, or should, to realize that nature is not concerned about democracy. I have never seen historical data: Climate change in 2010 cost X, benefit Y. Then 2011, 2012, 2013, 2014, 2015, 2016. Data for 2017 are still coming. Does IPCC work that way, or a pure fantasy way? The climate policy emperor has no clothes, during or after leaving the White House. I wrote a book on this subject: The Climate Bottom Line by David B. King. It is available on Kindle. The discount rate is where hack economists all over the world, fudged their cost benefit analysis. Because most of the alleged benefits of CO2 reduction are over 100 years in the future, if they are discounted to the present value of those future benefits, any funds spent today flunk cost benefit analysis. Consider an escrow account with a thousand dollars payable 100 years from today. How much would you give me today for that $1000 a hundred years from now?. If your answer is $1 that is the present value. If a commonly used discount rate for dams, power projects, roads etc. were used on Gov. climate cost benefit analysis they would all flunk cost benefit analysis and be illegal. This is an interesting issue. I think I would run multiple profiles (say 1000) in a stochastic simulation with built in feedbacks (for example if all hell breaks loose with temperature, the economy probably sags, this reduces emissions). Each profile would have some sort of probabilistic description of key parameters, including climate sensitivity. Then, when we see the bottom line I would discount at different rates. In my consulting job I’ve also suggested using variable discount rates (this gets complicated, but it’s reasonable for very long term analysis). From what I’ve seen, this type of work is in its infancy, possibly because there’s a serious disconnect between all the parties involved. Climatologists don’t handle economics very well, economists seem to think there’s no debate or un certaintity. And neither knows much about engineering, cost analysis, project management or how to handle risk. They’ve never put heavy lifters with a large budget into this type of work. This is one reason why I can’t support doing much at this time, they just lack economic support, they need to learn how to do a proper analysis, and when they do they will probably find its better to cherry pick and only do what’s very evident will help somebody (say like financing the hydropower dam in Congo). . Cost of global warming — as opposed to what? No warming, cooling? What’s the cost of a cast iron stove falling out of a B-52 and landing on your dog? As opposed to say forcing Pakistan to use electric vehicles fed by solar power and wind turbines. I’m sure Michael Mann, Al Gore and Elon Musk will have some great ideas. One thing to keep in mind is that the one thing necessary to combat climate change, whether high or low temperatures, is plentiful, inexpensive energy. Good essay. My only quibblemis that even the careful work of folks like Tol and Lomborg is way too speculative to carry much weight. Rud, That was my conclusion as well. But, the work (especially Tol’s) was useful in that it got people to start thinking quantitatively. If everything the alarmists say is true and we actually follow their advice, what happens? I don’t believe their numbers, but I’m very glad they did the work. Businesses, especially long term businesses, like oil companies, do these numerical fantasies all the time. Heck, I did some before I retired. increased by somewhere between 1.0 and 1.5 degrees C.
that the SOLE cause is that the winters are less cold than they used to be. at all about the increase in temperature so described ? You are correct, night time temperatures are going up faster than daytime temperatures and winter temperatures faster than summer. It isn’t just your street, its the whole world. Many more people die in the winter than in the summer, which is one reason that cold-related deaths are decreasing much faster than heat-related deaths are increasing. You are being selfish. You are supposed to feel bad because the natives of a village in Alaska are going to have to stop pulling their sleds with snowmobiles and learn to fish for grouper. Perhaps the milder winters will permit the Alaskan natives to advance into the age of wheeled carts. You live on a hill in Wellington and you’re wondering what all the fuss is about? Nearly all warming has been in the winter , in the high latitudes, and where ocean effects are largest. So what is all the fuss about ? It all boils down to whether one accepts or dismisses the Precautionary Principle. I for one am in the Michael Crichton camp on the PP. That is, that the PP is self-contradictory in the climate arena. Adopting the PP would lead to less resilience, less ability to mitigate destructive storms, floods, droughts and any resulting human famines and the terrible ecological damage a starving major-size population would produce. The PP in regards to a humanity reducing carbon emissions without a less costly energy source is intellectually bankrupt. The precautionary principle tells me I’d better focus on making sure the commies don’t take over the world. They are destroying Venezuela, the flood of refugees, cocaine, and diseases out of that poor country is terrible, and meanwhile Obama goes to Cuba to cozy up with Castro? Give me a break. Nothing wrong with making people wear a hard hat in a construction zone. They are relatively cheap. Having to wear them can be annoying at times, like when the only “construction” left is the contractor sweeping the floors, but buying them was a one-time expense. Applying PP to CAGW and a host of other “Environmental” causes is a nation’s “The Death by a Thousand Cuts”. Your Figure 1 shows the temperatures for RCP 2.6 flattening mid-century and maybe declining by end-of-century. To me, that would imply that we have passed the mid-point of our current interglacial and natural influences dominate the response. Yet, there seems to be no independent confirmation of being half-way through the current warm spell. Indeed, in the absence of data to indicate that we are near the mid-point, Occam’s Razor would suggest that we should expect a continuation of increasing temperatures, such as shown in RCP 6.0. Thus, RCP 6.0 would appear to be forecasting that the effect of CO2 is smaller than commonly assumed by alarmists. The natural influence hasn’t been adequately untangled from the anthropogenic component. That might be because those whose salaries and career paths depend on demonstrating the danger of human use of fossil fuels depend on assigning blame to humans. That might also be because “Occam’s Razor would suggest that we should expect a continuation of increasing temperatures”. There is no reason to believe the beneficial rise in temperatures will continue now that the AMO and PDO are turning, and we are heading into a solar dip. The only warming in the last 40 or so years has come from ocean events. There is no reason to expect that to change., and we are heading into a series where La Nina will rule. Only if you “believe” the unproven myth of CO2 warming would you expect further beneficial warming. Clyde, the carbon sinks remove CO2 as a function of atmospheric concentration, temperature, ocean surface ph, etc. When emissions drop the sinks continue removing CO2, this leads to a small temperature drop which reduces humidity. Since water vapor is the main greenhouse gas the models show an additional temperature drop, which in turn reduces humidity even further. This effect is ignored by climate wonks who insist we have to have “negative emissions”, which they think they’ll achieve with “CO2 capture”, one of the stupidest ideas I’ve ever seen. I’ve yet to see any convincing argument that the warming to date has cost anything at all, indeed the reverse is likely to be true. As a test of this, if we had a control knob, who would send us back to 19th climate? There is no doubt that the warming out of the coldest period in 10,000 years, has been purely beneficial. As has the increase in atmospheric CO2. Massively beneficial to all life on Earth. Andy, one thing i never see in these cost analyses is the impact of monetary policy. Let say the cost is trillions of dollars in lost gdp. That would mean folks are consuming less and that would also mean lower inflation. Were that the case, central banks would keep interest rates low allowing for greater economic growth to compensate. (as is actually happening as we speak) It’s not inconceivable that, in lieu of monetary policy, mitigation measures could have no cost whatsoever. See how easy it is to create jobs? Woops! That’s ‘Global’ but it might be a Freudian slip because you can see how that creates proof-reader jobs. How about we calculate the cost to everyone of the needless obstacles to economic growth and production inflicted on purpose by the eco-nut movement, and then file a class action lawsuit? No where is it mentioned the affect agriculture actually has and how much carbon has been admitted into the atmosphere from working the land and losing the carbon in the soil it’s a very serious problem much bigger than anyone realized. It can however be reversed with very little cost by simply reducing fossil fuel usage andj synthetic fertilizers and significantly reduced tillage of the land.. the soil is a living entity which we need to rebuild. We can easily reverse the carbon content in atmosphere by having healthy soils and building organic matter. The results from this or dramatic inclimate and human health and health of the planet in general. This whole idea is based around a new movement called regenerative agriculture we simply need to motivate Farmers across the world with a small Financial and stewardship initiative.